Here we are with yet another wireless speaker for your due consideration, where it is the combined efforts of Soundfreaq and The Novogratz to roll out a limited edition of the Boom Freaq wireless speaker that ought to hit the market just in time for Father’s Day. Wait a minute here, Father’s Day? Mother’s Day isn’t even over, and we are already targeting dads? Well, you know how men are, they tend to leave things to the last minute, so it makes perfect sense for the Boom Freaq to be “advertised” early enough, so that the men are able to make the relevant preparations beforehand. 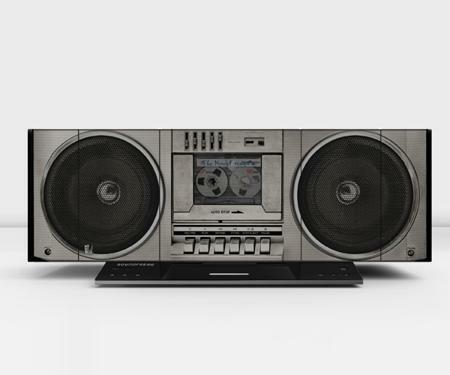 The Boom Freaq is one particular device that was Inspired by old school boomboxes, where it will merge The Novogratz’ unique design concepts with Soundfreaq’s award winning wireless speaker, Sound Stack. Of course, the early bird gets the worm, so you might want to get your action on with a pre-order for the $350 Boom Freaq. The Boom Freaq has picked up its fair share of gongs before, where it was named “Gear of the Year” by WIRED Magazine, and this has been shown with the Sound Stack being meticulously crafted to capture the nuance of every note, where it also complements every genre of music regardless of the volume level. Not only that, Sound Stack will also enable users to stream music wirelessly from any Bluetooth compatible device, where these would mean the compatible devices from the iOS family such as the iPad, iPhone and iPod touch, as well as Android-powered and BlackBerry devices. In addition, Sound Stack will also come built with a 30-pin dock, where they have also thrown in a new added feature that will comprise of a Lightning connector, so that users are able to dock and stream from Apple Lightning compatible devices such as the iPhone 5, the 5th generation iPod touch, the 7th generation iPod nano, the 4th generation iPad, and the iPad mini. The New Seiko Astron – What Time is it Where You Are?